Looks like Apple has decided they will not be allowing any tethering applications in the AppStore. 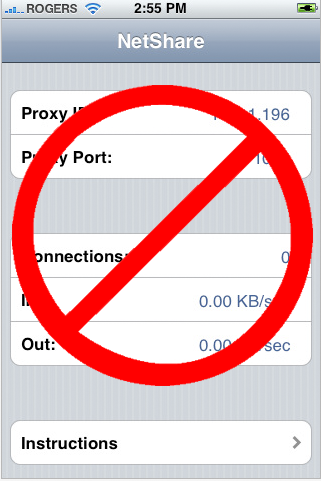 As such, NetShare will not be available in the iTunes AppStore. We are seeing a lot of similar reports from various developers who's applications were abruptly removed and banned from the AppStore without any violations of the terms of service. This is all unfortunate news for the iPhone platform end-users. Of course, this also bodes ill for PdaNet and any other folks looking to create tethering apps. Just ain't gonna happen, folks. The App Store cancellation / banning / NDA / mystery is starting to approach critical mass. Dave Winer nails the real issue here: there's no way to app developers to find out whether or not they're going to even be allowed to sell their app via the App Store until after they've put all the work into creating it. Developers are all sitting "Before the Law," hoping the gatekeeper will suddenly become reasonable and rational. For tethering apps, at least, that hope is in vain. We're still holding out hope for Podcaster and, well, for a lot of others.